JZ 644.005 Macosa G22U 1500 hp A1A-A1A at Speilfeld Austria October 25 1975 by Ray Graf. JZ 661.276 GM-DD G16CW 1800 hp at London Ontario GM plant November 1974 by Don McQueen. JZ 664.033 GM-DD G26CW 2000 hp Co-Co at Vinkovci March 14 1979 by Jim Claflin. 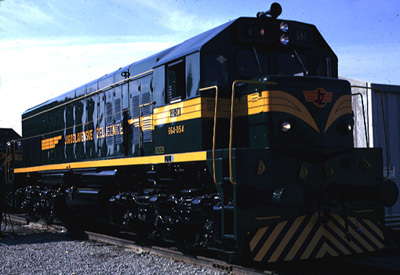 JZ 664.054 at London Ontario plant August 1973 by Larry White.